1980: EAC begins a newsletter intended to appear "between the issues" of Jusun, but Jusun soon ceases to exist. We also hold our first auction, a lively fundraiser that becomes a tradition. Early '80s: Uranium mining is a hot topic. Among EAC's activities: submission of a brief to the McCleave Uranium Inquiry. The inquiry results in a moratorium on uranium exploration and mining in the province. Related concerns for EAC at this period: nuclear power and nuclear waste. Early '80s: Height of the battle against aerial spraying of herbicides. There's a Royal Commission on Forestry, and 16 Cape Breton landowners launch a legal challenge against N.S. Forest Industries. Sadly, the case is lost. EAC is a major supporter of the effort. Early '80s: EAC's Agriculture Committee organizes annual Alternatives in Agriculture conferences in association with the Atlantic Christian Training Centre in Tatamagouche. The committee eventually splits off as an independent group. 1986: EAC has to leave Dalhousie University. Since then we've had five homes: the Roy Building, Barrington St. (fall '86); Veith House in northend Halifax (April '89); 1553 Granville St. (early '95); 1568 Argyle Street(June '96); and our current home (April '06). Oct. 1987: EAC produces and distributes 25,000 pamphlets on hazardous waste, and a year later holds its first Household Hazardous Waste Day. Six depots around metro accept waste from 600+ people. Summer 1989: Start of EAC's composting project. Garden-related projects over the next decade include community gardens (not our first), the Get Your Lawn Off Drugs campaign and the Schoolgrounds Naturalization project. 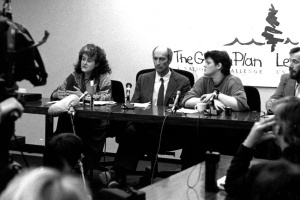 Nov. 1989: First meeting of the Wilderness Committee. Forestry and the need for ecological reserves are hot topics from the start.